WASHINGTON—Gently placing his hand on the small of Jared Kushner’s back, Saudi Crown Prince Mohammed bin Salman applied only the gentlest of pressure—no more than a petal falling to the surface of a fountain—and in a voice heavy with anticipation, whispered “You are the jewel of my collection,” thus guiding his frightened new prize toward his harem, royal sources confirmed Thursday. 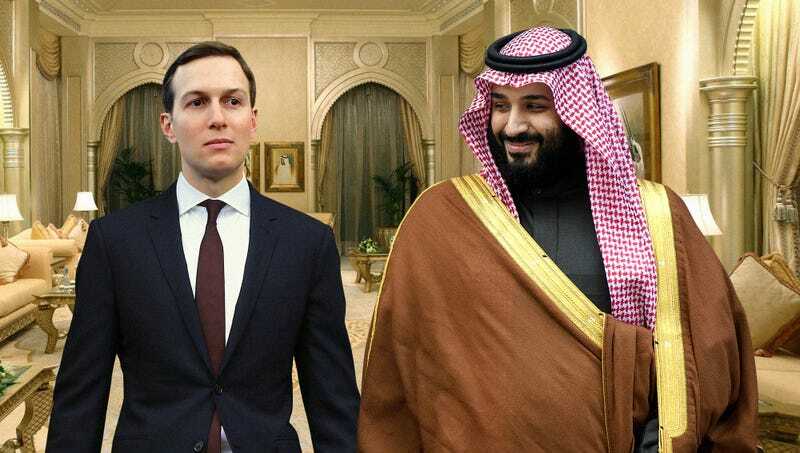 “Once we reach my palace and you pass through the secret doors of scarlet silk, your former life’s tribulations and entanglements shall fade, and you shall live to serve me and me alone—this I swear to you, most precious and delicate Jared, that you will want for nothing,” said bin Salman, collapsing onto a velvet fainting couch as his concubines adorned the White House senior advisor in sheer yet elegant robes and anointed his skin with rosewater. “Do not tremble, my doe; my lamb; my delicate bird. The inevitable is nothing to fear, and already your soft features and perfect alabaster skin have set you in a high place among the most cherished of all my playthings. Come to me, so that I may drink deep of the wonder and spectacle that is my Jared Kushner.” At press time, Kushner, now shirtless and moving as one in a waking dream, had draped himself along a sumptuous bed of pillows and closed his heavy eyes, his mind escaping on the rivulets of gentle music played on an unseen lute.